Home / 2017 Belmont Stakes / Should You Bet Closers in the Belmont Stakes? Should You Bet Closers in the Belmont Stakes? Most horseplayers have assumed that when it comes to the Belmont Stakes, that the 1 ½ miles distance has to favor closers. Well, they got that half right. If you are talking about third and fourth place, both mid-pack and, to some degree, deep closers do dominate the bottom of Trifecta’s and Superfecta’s. But, that is not the case with the win and place spot, particularly in recent years. While doing our analysis to create the screening criteria for the Belmont Super Screener, we came upon some interesting insights centered on the role of “running styles” and their impact on the outcome of the top four Belmont finishers. Below is a chart we compiled that shows the top four finishers of the past 10 editions of the Belmont Stakes, their odds and their Energy Distribution Profile. In addition, we captured the quarter mile and 6 furlong factional times of each race. Click on the image to see it full-size. Of the 40 possible finish opportunities, Closers/Deep Closers accounted for 24 or 60% which is lower than what you’ll find for the Kentucky Derby (70%) over the same 10-year period. Most of the closers took up the 3rd and 4th place slots of the Superfecta. At least 2 Closers/Deep Closers hit the Superfecta in the past 10 editions (and this pattern holds even if you go back to the past 17 years) of the Belmont Stakes. Only two Pace types have won the Belmont Stakes in the past 10 years (or even the past 15 years) and that was Zito-trained Da’Tara in the 2008 Belmont in which the Triple Crown bidder, Big Brown was pulled up, and the first Triple Crown winner in 37 years – American Pharoah in 2015. In just the past 6 years, Pressers and Pace types have dominated the Exacta and of the 9 horses meeting these running styles only 2 went off at odds of less than 8 -1. 2nd place is where wire types go to fade and that has been the case for 3 years of the past 5. 3rd and 4th place is where you’ll find most of the 15-1+ shot bombers landing and of the 8 long shots meeting this criteria all but one of them were closers. Most of the horses that ran in the Kentucky Derby and hit the board in the Belmont Stakes finished in 2nd place. Unlike the Kentucky Derby and the Preakness Stakes, the pace in the Belmont Stakes has little bearing on which “running style” will be favored. This year’s Superfecta is likely to be dominated by horses sitting in Win Zone 2 (within 5 lengths of the lead). Pace projects to be faster than par and there will be solid pressure. At least one closer will hit the Superfecta and, if history repeats itself, we could see two closers hit the board. 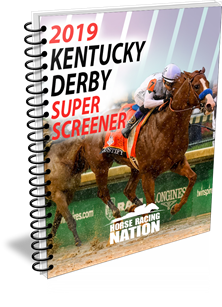 The Super Screener likes one closer in particular going off at odds of 25-1. Classic Empire by virtue of his narrow loss in the Preakness will be the prohibitive favorite. However, while he is a top win contender, the Super Screener likes one horse in particular equally as well and odds on that horse could be has high as 10-1. There will likely be up to 7 horses that will go off at 15-1+… which one of those bombers has the best shot to hit the Superfecta? … our selection will be a surprise to a lot of people. Get Your Copy NOW and Get a Head Start on WINNING the Belmont Stakes!